When I heard my family out on the East Coast was having Eggplant Parmesan (aka parmigiana di melanzane, or melanzane alla parmigiana) for Christmas dinner, I got a taste for eggplant . . . only I needed a gluten-free, dairy-free option. 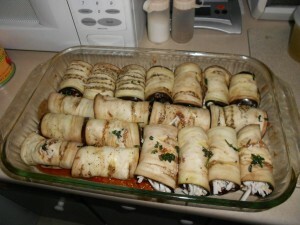 So I searched for “Vegan Eggplant Rollups,” then melded what I found into the following recipe. For a first try it was amazing!! Prepare the mushroom/spinach filling: Heat oil in a large sauté pan over medium-high heat. Add shallots and garlic and stir until lightly browned, 1-2 minutes. Add mushrooms and sauté until they release their moisture and start to brown. Add spinach and olives and cook until heated, stirring frequently. Add Italian Herb Seasoning and salt and pepper to taste. If you haven’t already done so, prepare the Cashew Cream Cheese and heat the tomato sauce. Thinly slice the eggplant lengthwise. The slices should be approximately 1/4″ thick. I used my OXO mandoline slicer set at 1/4″ (though the slices seemed thinner than that). I ended up with 19 slices from my two eggplants. Line two cookie sheets with paper towels. Spread out eggplant on the cookie sheets (it’s okay if they overlap a bit). Sprinkle both sides of each piece with salt. Let sit for 15-20 minutes to release moisture (and bitterness). Pat dry. Preheat oven to 400°F. 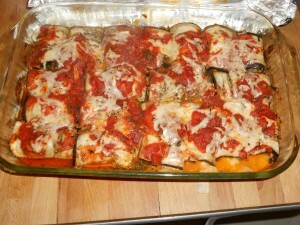 Arrange eggplant on parchment-lined baking sheets. Season lightly with salt and pepper. Cover tightly with foil and bake 8-10 minutes until tender and pliable, but NOT fully cooked. Spread 1/2 cup tomato sauce on the bottom of a 9″x13″ baking dish (glass or ceramic, not metal). Spread each slice of eggplant with a thin layer of cashew cheese. 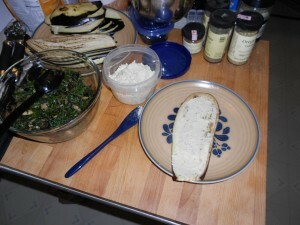 Then spread a small amount (approximately 1 Tablespoon) of spinach mixture over the cheese. Roll up and place seam-side down in baking dish. NOTE: I ran out of spinach filling after 15 rollups, so the last four (on the bottom right in the picture) are filled only with cashew cheese & vegan mozzarella. 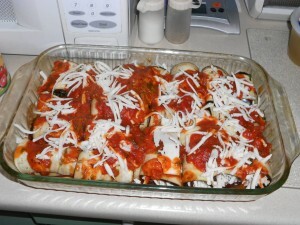 Once all the rollups are in the dish, top with the remaining tomato sauce and the vegan mozzarella cheese. Cover tightly with foil. Bake until tender, about 60 minutes. (I removed the foil for the last 10 minutes to get them nice and browned.) Remove from oven and let cool 5 minutes before serving. NOTE: this is not exactly what I did for Christmas. I made this recipe again later (to use on pizza!) and liked the second version better, so that is what I’ve written down here. Combine all the ingredients in a food processor or mini-chopper. 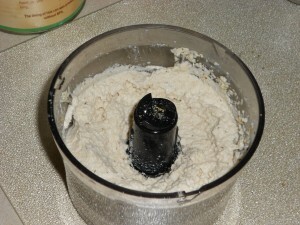 Blend until smooth and thickened. You may need to stop a few times and scrape down the sides of the processor. These proportions worked well as a spread. If you want to use this as a “dip,” add more water or some coconut milk (or other non-dairy liquid) until it is the consistency you like. This entry was posted in Italian, Recipes and tagged cashew cheese, dairy-free, eggplant, gluten-free, mushrooms, spinach, vegan cheese by HSG. Bookmark the permalink.